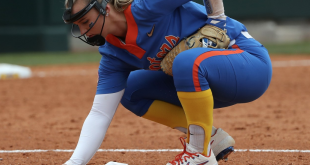 The sixth-ranked Florida Gator softball team bounced back Friday to defeat No. 11 South Carolina at Katie Seashole Pressly Stadium 3-1 The Gators (35-7, 10-3 SEC) defeated South Carolina (34-8, 8-5 SEC), 3-1, to take the first game of the series. 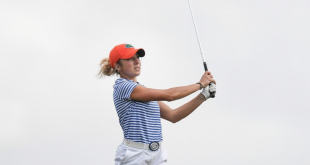 The Gamecocks are in third in the Southeastern Conference standings, while the Gators top the list. 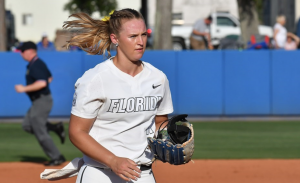 A key performer in this game was Florida pitcher Kelly Barnhill (18-1) who has a 0.80 ERA. 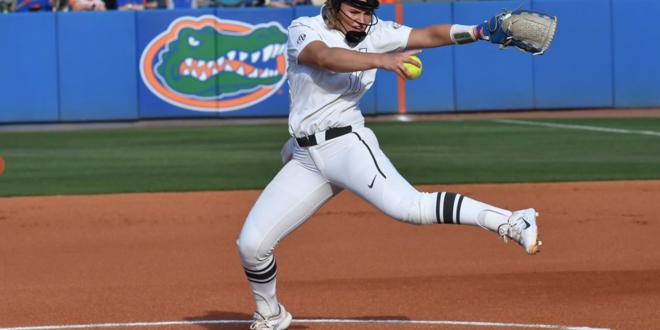 The junior threw her second one-hitter of the season and struck out 13 in the complete-game effort against the Gamecocks. Barnhill wasted no time. In the top of the first,she struck out the side to start the game for the fourth time this season. It was also Barnhill’s 22nd time striking out the side this season. However, Barnhill admits having runs on the board is a huge confidence boost. In the first inning, freshman Hannah Adams raced home on passed ball by South Carolina. Cayla Drotar’s pitch went in between the legs of catcher Anna West, and Adams was able to score to take the Gator lead, 1-0. The scoring continued in the second inning. Sophia Reynoso scored to make it 2-0 Gators after she reached base on a fielder’s choice and stole second. Alex Voss slugged a 2-2 pitch over Kennedy Clark’s head for an RBI double to left field that plated Reynoso. And It wouldn’t be a Gator softball game without a home run. Nicole DeWitt recorded her ninth home run of the season in the bottom of the third inning. 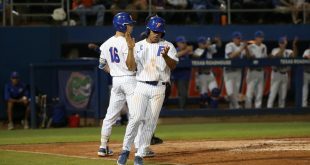 The final run for the Gators was also the senior’s 24th career home run. Barnhill’s pitching was nearly perfect until she gave up one hit. Tiara Duffy drove Barnhill’s pitch to the gap in right center. 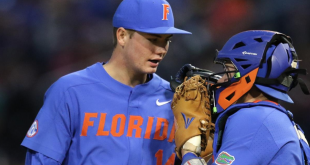 Duffy’s double drove in Kennedy Clark, busting Barnhill’s no-hitter and a Gator shutout. But the Gators would hold on to win, making them 3-3 over their last six games. The series will conclude Saturday at Katie Pressly Stadium with a doubleheader scheduled for noon. 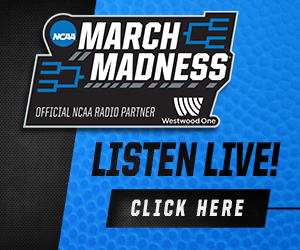 The games will be streamed via the SEC Network + which can be found on WatchESPN.com of the WatchESPN app.